Bydgoszcz won the prestigious contest CIJ Awards Poland 2017 in the „Best Investor-Friendly Region/City” category. The award ceremony took place on November 9th, 2017 during the grand gala of the CIJ Awards Poland 2017. The CIJ Awards is the longest-running commercial property awards event in Poland and has evolved continuously over the past 16 years to keep pace with changes in local, regional and international property markets. It concerns office, residential and industrial property, as well as commercial real estate markets. Not only investments, but also ingenious ideas and solutions in this field are awarded each year. Moreover, the event is a unique opportunity to gather representatives of the leading companies and entities, who create new visions and invent innovative projects. Of 100 nominations submitted at CIJ Awards Poland 2017, the Jury Committee consisting of investors, developers and funds and the Online Jury Voting Committee, selected the winners in 37 various categories. 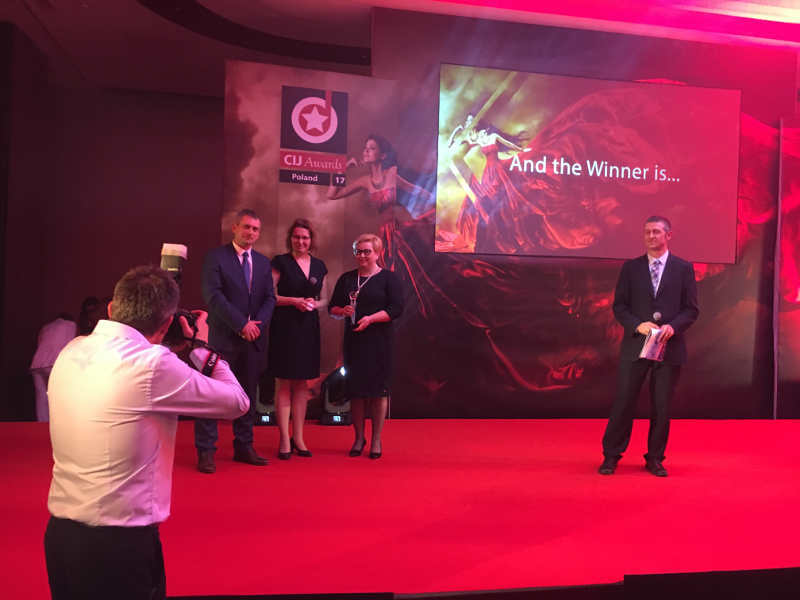 The award for the City of Bydgoszcz was handed to Edyta Wiwatowska, the President of the Board of the Bydgoszcz Regional Development Agency, during the annual grand gala on November 9th. – This ranking is a proof of appreciation for Bydgoszcz, which puts great emphasis on professional services supporting investors. This was also confirmed by the first place for Bydgoszcz in the independent World Bank report, “Doing Business in Poland 2015”, for efficient entrepreneur service. We are aware of the crucial influence of private investors on the city’s development. Our model of cooperation with them works very well. New jobs, shops, offices and services are the most visible results of this partnership, which also led to decrease of the unemployment rate in Bydgoszcz to the lowest level of 4% – says Rafał Bruski, the Mayor of the City of Bydgoszcz. In 2017, thanks to activities of the Bydgoszcz Regional Development Agency, Bydgoszcz has been also nominated in another important contest – Eurobuild Awards. Eurobuild is a prestigious magazine and portal dedicated to commercial real estate. Eurobuild Awards is a unique initiative, which has quickly become one of the most important events for the commercial real estate market in Central and Eastern Europe. It is worth mentioning that two years ago Bydgoszcz won this competition in the “Most investor-friendly city” category, in which it has been nominated again this year. The Eurobuild Awards 2017 gala is going to take place on December 6th.